What makes Soave Classico exceptional - and separate from Soave DOC? In this short video, you'll join Austin Beeman and Suavia on the hills of Soave Classico to explore that question. This is Episode #65 of Understanding Wine with Austin Beeman. Two villages have Classico area inside their territory. One is Soave, so the main village, and is on this side, over here, and the other one is Monteforte and is on the other side of this hill. So our hills are right in the middle between the two districts. And here you can see clearly what's the difference between Soave Classico and Soave D.O.C. Soave D.O.C is the flat area you see there. It's a huge area of production of white wines. It's the largest area of production of white wines in Italy, so it's very, very large. From the flat basically come all the wines that people sadly are accustomed to know as Soave, so a very cheap, low-quality, easy white wines. Very big quantities. Not very high quality. Here is another world. This is our main territory, the basalt rocks. So these black stones that sometimes are really, really big, like masses, which we can find all around inside the soil and the color of the soil which is ... it goes from the black to gray to red, reddish. It full of minerals, so all these are characteristic like minerality and richness in element, go directly into the wine so the wines are very mineral, complex, and sometimes you have also kind of smokiness that comes directly from this kind of soil. We grow Garganega in this way, which is particular way because yeah, I think the growing season you are more ... you see the most use of small vines, but here this method is a very ancient one, and it's called Pergola Veronese and you see that we let the vine to grow up until it is like two meters more or less, and then we leave the branches of Garganega to fall down on these iron threads. And this is why we will follow the nature of Garganega plant because it is a plant with branches that tends to go downwards and not upwards. Also, the berries of Garganega ... the skin of the berries is very delicate and so especially during the hot summers, it needs to have like umbrella, an umbrella to be covered. And so in this way, all the leaves of the vine act as an umbrella on the branches, on the grapes, and so they don't get sunburned basically. So this is the most clever way to grow Garganega and it's also the historic one. With the Trebbiano we use this system because the nature of the vine here is more to use the Guyot system. The branches of Trebbiano are very vigorous, so they tend to go upwards and not downwards so they don't need the iron threads to support the branches, and the skin of Trebbiano ... Trebbiano is a very strong variety and the skin is thicker than Garganega and so it doesn't need that umbrella that Garganega needs. 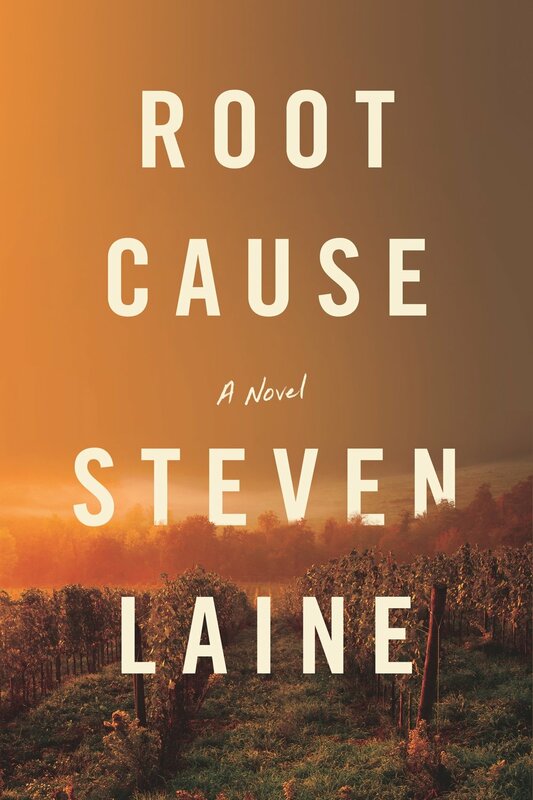 Root Cause by Steven Laine is a globetrotting ‘beach-read’ thriller set within the world of wine. Corvina Guerra, a flying winemaker for one of the world’s biggest wine brands, discovers the devastating aphid Phylloxera in an Italian vineyard. Even worse, this strain is resistant to the grafted rootstock that saved European wine production in the 1800s. Corvina partners with Bryan Lawless, a disgraced Master of Wine candidate, to find the ‘root cause’ of this outbreak. They will quickly discover that this is an malevolent attack and the entire world’s wine production is at stake! This is a truly global adventure with sequences in California, France, Italy, South Africa, Hong Kong, Chile, London, Canada, and more. The action is fast paced and suspenseful, but always stays light and fun. Steven Laine has also seeded this novel with large amounts of wine knowledge that will excite any reader with a casual interest in wine. For sommeliers and wine experts, you aren’t going to learn anything new here, but you’ll likely have a great time reading it. The dialogue is always snappy and speaks in the voices of the characters. I could see this turned into a 10 episode Netflix show with little change to the dialogue. The use of the world of wine. There are so many cool little sequences in different wine-producing countries and different aspects of the wine business. I was originally worried that it would focus on only Italy and California, but Laine really makes good use of the whole planet. There are so many situations and wine regions referenced that I never felt that any of them got their descriptive due. Part of the attraction of the wine business is the bucolic landscapes, luxury restaurants, delicious food, and old-world villages. I was really hoping for some lush sensory sequences akin to what one finds in Ian Fleming’s James Bond novels or Peter Mayle’s novel of Provence, France. When that world-building occurred, it was often rushed past for the next plot sequence. I’d recommend removing about 40 pages of plot and replacing it with 25 pages of immersive description. This is a fun read and expect anyone with at least a passing interest in wine to enjoy it. I’m looking forward to reading Steven Laine’s next novel about wine. I received a free copy of this book in return for posting an honest review. In my job at Cutting Edge Selections, we currently sell in Ohio and Kentucky some of the wineries referenced in the novel. Trebbiano di Soave almost disappeared from the world. The high quality - low yielding grape variety had been the backbone of Soave Classico until the Second World War. Ripped out in favor of mediocre grapes that produced higher yields, Trebbiano di Soave almost went extinct. This four minute video - shot in the hills of Soave Classico - details how the team at Suavia brought it back to life. This is Episode #64 of Understanding Wine with Austin Beeman. Trebbiano di Soave was a very used variety especially at the beginning of the last century. Then after the end of the second World War with the bad economic situation in Europe and in Italy, people needed to produce more, and so they wanted to produce more. They didn't care about quality or everything in it, and they wanted quantity. Garganega is a very productive and a very easy to grow variety, while Trebbiano is not very easy to grow and not very generous, so they decided just to displant Trebbiano and replant Garganega, so the real Trebbiano di Soave, the ancient one, almost disappeared from the area. When people rethink about restart planting Trebbiano di Soave in the '70s or the '80s, they started to ask to the baby wine grovers where to find the ancient Trebbiano de Soave, but they didn't know, because it was almost disappeared, and so they started to sell other kind of Trebbiano instead of Trebbiano de Soave. On the flats, you can find here in Soave a lot of vineyards with Trebbiano Toscano or Trebbiano ... They grew other kinds of Trebbiano, but not the original Trebbiano de Soave. My sister, which is the wine maker, with her professor at the University of Milano-Bicocca, an historical of the genetics of different varieties of vine, started this project to recuperate the original DNA of the ancient Trebbiano. This ancient Trebbiano was only possible to find here in this Soave Classico area, because here is where the oldest vineyards of the old Soave Classico area are. We started to go in the vineyards and ask old people where they remind where old Trebbiano de Soave vines were. We selected some vines, some very old vines, 60, 65 years old, and we took the DNA from these vines and with clonation, we recuperated this DNA and we produced all the vines in 2004. And in 2006, we planted this first vineyard. And so now it's eight years old and we are producing the third vintage of our wine, which is Massifitti, and you will taste it later. And it's this Trebbiano di Soave 100%, which is the first example in the old Soave Classico area of a pure Trebbiano di Soave. We are very proud of us and also because many, many wine areas, now more and more, they are starting to study about Trebbiano, to plant Trebbiano, and to try to make his own wine from Trebbiano, and so they are following this project and this study, and we are very happy about it. The Union des Grand Crus Tasting Tour is an annual event where member of the wine trade get the opportunity to taste the newest vintage of Bordeaux and interact with the winemakers and vignerons. For the second year in a row, I’ve had the privilege of attending the tasting in Chicago. Definitely a cold January day, but an awesome experience to get a picture of the newest crop of premium Bordeaux. Enjoy this quick four-minute video, covering the event and my impressions of the 2016 Vintage. Okay. So I just left the Drake and I've got the black hands and black teeth to show for it from the fact that I've tasted 200 plus Bordeaux in the last four hours. I wanted to talk a little bit to all you about some of the impressions that I had. This is a vintage that I heard over and over is a great Bordeaux vintage for a very different way than previous great Bordeaux vintages. In 2015, 2009, 2010, 2005, 2000, '95, '96, the vintage had a very strong identity. In this vintage, the thing that the winemakers kept saying is that this is a vintage that is great because of how easy it was to make the wine that you wanted to make. If you wanted to make a classic Bordeaux, a little bit harsh when it's young and age into something beautiful, you could make that. That was very easy to do. And if you wanted to make very modernist Bordeaux, Bordeaux that is lush and juicy and high alcohol and just gushes flavor at you, this is a year when that was also very easy to make. It didn't matter whether I was talking to people from St. Emilion or people from St. Julien or people from Pessac-Leognan, they were all saying the same thing, that this is the major characteristic of the 2016 vintage, and this is the thing that makes that 2016 vintage different from past vintages. When I compare this to coming to Chicago for the 2015 Union of Grands Crus vintage tasting, that was a vintage where the Pessac-Leognan Grave area really dramatically stood out as the superior area. This was a year where I felt that in most areas lots of wineries made pretty good wine, and a few made truly exceptional wine, wineries like that, that have big prestigious names and really serious winemakers behind them. This was a vintage in which I think that they stood out from the crowd. But if I have to say, "Okay, this is going to be a better vintage in this area of Bordeaux," I am going to put that on Margaux and St. Julien. In my little book, the ‘le carnet’ that they give you to write in with each of the different wineries you're tasting, when I was looking in through that, I was noticing that when it came to the sections for Margaux and for St. Julien, most of them were sort of noticeably good from those two regions. But then there were also at least two or three three-star wines from those vintages as well, things that jumped out to me as being a sort of truly exceptional bottle of wine. Those regions were above average than good across the board, and then had those outstanding, step up Bordeauxs. That's something that I'm pretty happy about, and I would definitely push Margaux and St. Julien as the two places that really rose above the others during the 2016 vintage of Bordeaux. So this is now one of my favorite restaurants in the world. Le Bistro du Sommelier appears to be just another bistro on the Boulevard Haussmann, but this is Philippe Faure-Brac’s bistro and therefore something special. Philippe Faure-Brac was awarded World’s Best Sommelier long before sommeliers were the hip celebrities they are today and Le Bistro du Sommelier Paris is his vision of a restaurant built around the art of wine and food pairing. At the core of the restaurant is a series of five-course pairing dinners where the wines are poured blind and it up to you to ascertain the grape, region, and producer. Something you do under the spotlight of your waiter, who is always a trained sommelier in her own right. It is a wonderfully fun way to enjoy meticulous wine and food pairing and learn a little in the process. Don’t worry though, additional treasures wait in the Cave below the restaurant. This video shows my first foray down there. After a beautiful dinner, we had it in our minds to find something incredible. So we went in search of a 1947 Alsatian Riesling. Stay tuned for the second video where the team of sommeliers goes to work opening the extremely old bottle. This the seventh and final part of my video interview with Mac McDonald of Vision Cellars. In this segment, Mac McDonald talks about his biggest "Pet Peeve" in the wine business.. The fourth part of the interview is here. "What Does Wine Mean to You?" Please enjoy this quick four minute video or read the transcript underneath it. This is Episode #61 of Understanding Wine with Austin Beeman. My pet peeve really about this is I have this all this thing about all of this stuff where people just write about wine and all these wine magazines and they tell you what you do and by the way, we get great press on all of our wines. And I always have this bottom line about this wine stuff, no matter what the press says about it. You know, our wines have been served at the White House since President Clinton administration. On the President George Bush administration, our wines was served there at least three times a year in all the eight years he was there which is phenomenal for a small winery like Vision Cellars. And I say with all of that stuff said, the bottom line is you either like the crap or you don't. I totally believe that. And it don't matter what the scores say, you do that. I like for folks to really understand you are the knowledgeable person about what you're drinking and it's okay to get opinions about stuff but you know you make your own decisions about what you like. And I see it's leaning towards that. More and more folks are saying, I like this. Or they'll say, I wouldn't have ever tried a Pinot Noir. I just like for folks to do that. The other part of this whole thing I like to see folks say, you know, if I'm having fried catfish and I want to have an 18.5 % Zinfandel with it, by God, it's my money and I oughta be able to have whatever I want with the food that I want. But that doesn't mean that certain pairing wouldn't go better. I'm not gonna say that wasn't. But that may be in my own mind that I think that'd go better. But for the person who is the consumer that's coming in to buy a bottle of wine or a case of wine, if they want to have one thing with they dinner, that's perfectly okay. I'm not saying, again, that it wouldn't be better to have another wine with it but hey, my taste buds not the same as yours maybe. So that's what I like to see folks do and appreciate and go out on a limb. Start enjoying what they like with the food that they have. Personally, I drink more wine without food than I do with food because it's relaxing, it's enjoyable for me and I like the flavor of wine. I'm not stuck on Pinot Noir. I try a variety of wines, Cabs and I try Sauvignon Blanc,, I try all types of stuff because I want to try all the different flavors of wine. Just explore this wonderful world of wine.